An ‘iron church’ opened at Sidley in 1885, in the parish of St Peter, and though a mission church designed in 1908 by G Hornblower (BN 95 p401) was not built, a more permanent one was started to a different design by G E S Streatfeild (ICBS under St Peter) in 1909, when the first part was opened at a cost of some £2000 (CDG Dec 1909 p207). This first part comprised the nave, covered in pebbledash rendering and low aisles that are divided by heavy buttresses, all covered by a continuous roof. The detail is vaguely Perp and the timber arcades recall a large barn, with two tiers of curved braces emerging from each post. 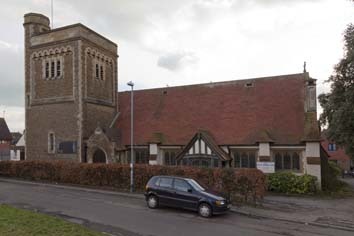 The church was not completed until 1927-29, when a generous legacy enabled Streatfeild and his then partner, Atfield, to elaborate his earlier designs. The most conspicuous part of the later work was the heavily square north east tower, which is out of proportion with the rest of the church. It is faced with brownish stone and the more generous funding allowed more elaborate detail for the chancel, which has an almost round-headed arch. Some of the detail is is rather odd, notably the broad seven-light east window and the arcades to the south chapel from both the chancel and, on a smaller scale, from the south aisle. 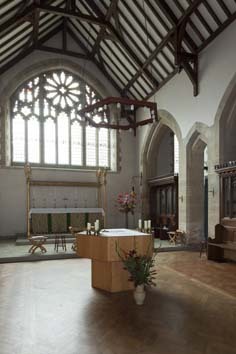 Both of these, though of three bays, have a narrower centre arch, which is lower in the arcade to the chancel. 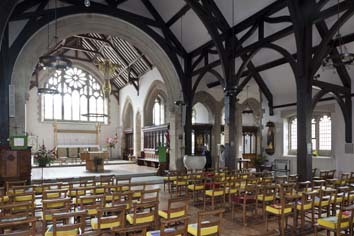 The main roof of the chancel is of hammerbeam construction. Font: Large and round and said to come from St Bartholomew, Brighton.